The 2016 Toyota Highlander, on dealership lots and in Tuscaloosa AL, is a high-water mark for three-row SUVs. How is this, you ask? Let us count the ways. If it's power you want, then check out the V6 models of the Highlander and their 270 HP worth of power, which also enables this midsize SUV to handle off-road conditions. If it's space you crave, then the 2016 Highlander has a spacious 83.7 cubic feet of cargo room in base models. And if it's savings that you value, base models of the 2016 Highlander norm 20 mpg city, 25 mpg highway, which is nice for a vehicle you can load up to eight people into. The 2016 Highlander has a nice combination of power and ruggedness to go along with its size and savings, and there's so much more worth covering. Like how the 2016 Highlander can get you out of a jam with its peak towing power of 5,000 pounds – this is power you can rely on for moving kids to college or to pull another vehicle out of a ditch. Another benefit of the 2016 Highlander is how it can keep you safer on the road with Daytime Running Lights that come with an on/off feature. The 2016 Highlander seats up to eight, so bring the whole crew along and enjoy the ride in this spacious SUV. If it's savings you desire, it's savings you receive with the 2016 Highlander's 20 mpg city and 25 mpg highway. A sizable 83.7 cubic feet in base models means you have plenty of room for your equipment or shopping bags. Now let's check out the trophy case for the 2016 Toyota Highlander. If it's safety you like, the 2016 Highlander was named an IIHS Top Safety Pick+ in models with optional front crash prevention, which means the Highlander is one of the most impact-resistant SUVs on the market. Which makes it the ideal vehicle to take your whole family along for a road trip to see relatives or historical landmarks, and Kelley Blue Book's KBB.com agrees, naming the 2016 Highlander one of the 16 Best Family Cars of 2016. Please be sure to visit us at Tuscaloosa Toyota, 3325 Skyland Blvd. 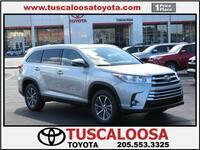 East in Tuscaloosa, AL or give us a call at (205) 553-3325, to set up a test drive of the versatile, powerful Toyota Highlander. Our 1 Price 1 Place policy means we have all available models set at one locked-in price, with no need for negotiations or haggling over the bottom line. Also, every Toyota vehicle you purchase comes with our no-cost non-factory Lifetime Warranty, which extends the standard Powertrain Warranty for any new Toyota model. Interested in a 2016 Toyota Highlander?